This post is for you my friend. I see that you've got your hand up saying "No more" to old, boring pizza. The frozen kind with the bland crust and the smallest ration of shredded cheese on top like there has been some secret global cheese shortage we're not aware of? I hear you girl. I'm here to shake things up a bit. Since Sam and I received our food intolerance test results back in May, we have been avoiding wheat and almost all gluten like the plague. We are both feeling way, way better, but this post isn't about that (maybe I'll do a follow-up if ya'll are interested?). Long story short, it has been a pizza-free zone for us the past few months. That is, until I FINALLY tracked down the pre-made cauliflower crust from Trader Joe's. You guys - I consider this a serious accomplishment. It took me 2 weeks, several phone calls, and 3 stores to finally get my hands on this crust. It sells out in like 5 seconds when they get a new order in apparently (yes, it is that good). Now you can certainly opt to make your own cauliflower pizza crust from scratch, but to be honest it seems like more work than it's worth. The Trader Joe's version does the same job and it's super cheap. Just take it from me and call Trader Joe's ahead of time so they will put one (or five) aside for you when you're ready. Even if you're not gluten or wheat-free, I honestly still recommend using a cauliflower crust for these pizzas because the extra addition of flavor compliments the ingredients so well. So, the other weekend when Sam was home from Virginia we decided to stay in and do a little date night: pizza and Netflix style. Earlier in the day, I began brainstorming Fall ingredients that we could use for our pizza to get in the mood for this upcoming season. Because I am far too indecisive, I jotted down a list of about 25 ingredients (quite possibly overkill, but whatever). Then, I let Sam choose from that list what he thought would taste the best together. After much consideration, we found that it was too difficult to narrow it down to one. So, instead we decided to make two pizzas on totally opposite sides of the spectrum: one sweet and salty, and the other earthy and rich. And guess what? They both tasted INCREDIBLE. Like, Verde Pizza (the best brick oven pizza in Baltimore) incredible. We could have easily served them to a restaurant full of people and made a ton of money. But, instead we decided to bring these two recipes to you. P.S. you're welcome. Now, get out there and do something with this newfound knowledge like... make the pizzas, impress your guests (even your Mother-in-law), and/or have a really cute date night with a bottle of chilled wine to celebrate the first official weekend of Fall. #BestSeasonEver. Preheat oven to 450F. Place crust upside down on a pizza stone (we used this one) or sheet pan. Bake for 10-12 minutes, turn over. Remove from the oven and quickly drizzle olive oil to cover pizza, spread evenly using the back of a spoon. Place crust back in the oven and bake for another 10-12 minutes. For a crisper crust, broil for an additional 4-5 minutes or until browned. Add pizza toppings to baked crust. Place the pizza back in the oven to broil for 4-5 minutes or until cheese is fully melted. Enjoy! *Caramelized onions: Peel the onion and slice one half into small, lengthwise pieces. In a frying pan, melt 1 tbsp of salted butter, add onion and cook at medium heat until soft. Add 1 tsp of white sugar, stir until combined. Cook for another 2-3 minutes until brown. *Crispy kale: Add 1 large handful of pre-washed baby kale to a cookie sheet. Drizzle olive oil on top, stir until all pieces are covered. Spread evenly on cookie sheet. Place in oven at 450F until crispy, about 10 minutes. *Butternut squash: Cut squash in half lengthwise. Scoop out seeds and discard. Drizzle olive oil on opened squash, rub in to cover evenly. Sprinkle salt and pepper on each side. Preheat oven to 450F. Place squash face-up on sheet pan. Bake for 50-55 minutes, broil for another 5 minutes if needed. Once cooled, make sure that the center is soft and fully cooked before cubing into bite-sized pieces. *Sauteed mushrooms: Heat 1 tbsp of butter in frying pan over medium-high heat. Add in 8 oz of assorted mushrooms. Cook, stirring for 5-6 minutes until soft and brown. Season with a sprinkle of salt and pepper. 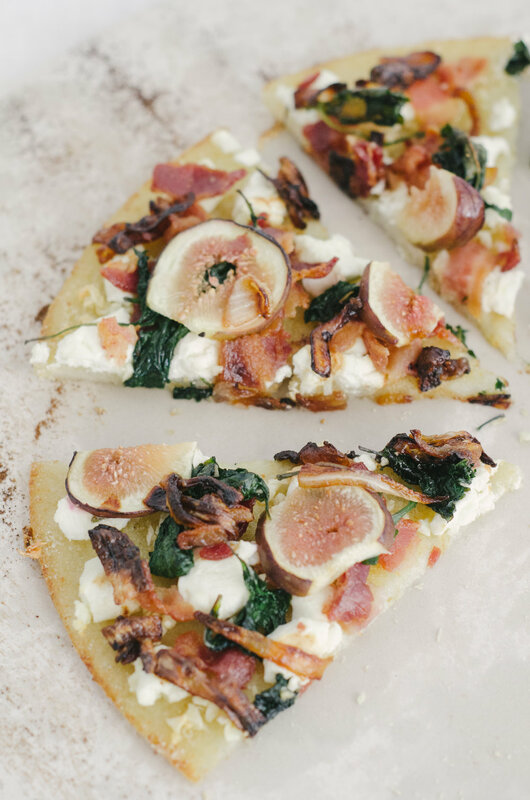 Let us know if you tried these Fall cauliflower pizza recipes! Tag us via Instagram or Facebook and tell us how they turned out.